Why yes, I am 29 again...have been for years now! LOL! How fantastic is that sentiment for a birthday card for any girlfriends who might be...ahem...a bit past the 29 point. Not that I would know anything about that... This is a very simple card, created ages ago and never posted, using one of my favorite Odd Bird Planet cupcake images. The cupcake has been paired with Basic Gray paper and a giant fabric flower from Stampin' Up! The charming sentiment is also Odd Bird Planet. (For a write up of the OBP product line, visit the Stamp NE blog sometime today, where they're being highlighted as one of the event sponors.) As for the answer to the "oopps, I did it again post"...you guys guessed right, it is a Britney Spears song. Now I confess, I have never listened to Britney Spears...honestly. However, years ago while flipping through the channels (I'm an obsessive channel flipper during commercials!) I stumbled upon the making of a video and it happened to be the Britney Spears video for this song. I watched for about five minutes and that darn song stuck in my head for days...it was maddening! LOL! And now that I made this post and have brought up that painful memory...the one line from the song is now stuck in my head again...Sigh... Jules and Cindy, please contact me at ksdm@comcast.net with your shipping address and I'll send you along a few goodies for playing along. :-) Enjoy! OK, this bird isn't even close to being a parrot...I mean where's the beak, the colorful feathers? Well it might not be a parrot but she might still want a cracker, no? :-) I am actually in need of a few cards this week...one for my SIL, who we're sending a very belated Christmas present to and a second for a friend whose husband is very ill. This card is for my friend, just to let her know that we're thinking and praying for them. 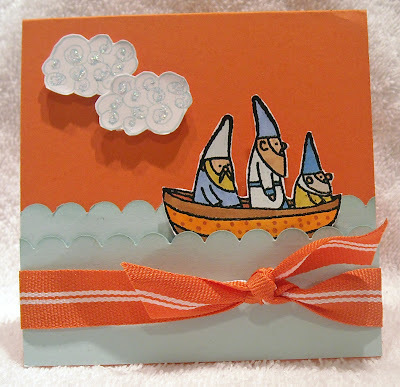 Admittedly, the idea for this card came from my Stampin' Up! catalog (insert sheepish grin). The idea that I cased was the branch with the green bird, which I really loved. For some reason I've gotten my mind stuck on the idea that the silhouette birds, from Papertreyink, have to always be black. 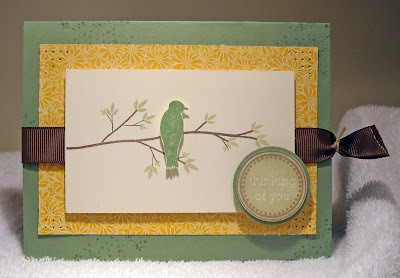 I loved that the green ink on the bird matched the cardstock. Gee, who would have guessed silhouettes look good in other colors too! 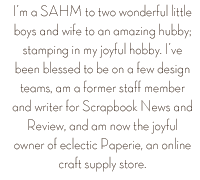 ;-) The patterned paper, cardstock, and ribbon are all from Stampin' Up! 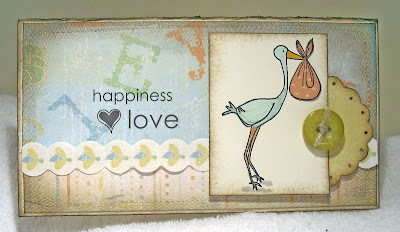 and all of the images, including the sentiment, are from Papertreyink. If you click on the picture it will enlarge and you can see some of the details a bit better. Enjoy! I again missed posting this yesterday, under the "Keep it Simple Sunday" heading! I was doing some work on my PC and my battery went ka-put. Since I was so snug under a warm blanket downstairs, a floor away from my charging cord, I opted for closing my laptop and staying warm instead of going upstairs to post! Bad blogger...hee hee This is a small 4x4" card that I created to enclose with some blog candy. A little note to say "hello" to my winner and thank them for visiting my blog. The waves were created by overlapping two pieces of scalloped paper. My boat full of wee gnomes fit perfectly in between the two waves. I'm in love with these gnome images from Odd Bird Planet...they are far too cute!! The cloud is also from OBP. 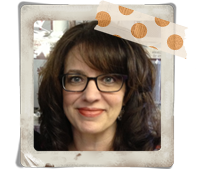 Paper and ribbon are from Stampin' Up! So...ready for a contest? Who can tell me what song my blog post title is from? I shudder to admit that I even know the song but it was the first thing that popped in my head when I started to post this morning. ;-) Give me the right answer and I'll send you some goodies that I've come across as I've been organizing out my craft room...You have until midnight (EST) tomorrow to answer. Enjoy!! Every once in awhile Stampin' Up! comes out with a set that rocks my world...I love all of their products but this set, Always, has that little something extra. I adore the bird and heart, the flowers and swirls (those are, of course, my two favorite stamp elements of all time), the sweet sentiments, and a wee berry branch, shown stamped in the background, are a few of the images included in this set. This is a fairly simple card design, which I created for a small class a few months ago. I love how the branch image makes fantastic background paper. And that swirly heart...yummy! This image also looks great embossed, which I did on this card. The bird works wonderfully well on cards, scrapbook pages, and could even be used as a name place card (wouldn't that be fun for a shower), or even a free standing birdie with paper clip legs...similar to what Erika did here. You can even purchase the image as wall art from SU! As for the "lacy" border of paper at the bottom of the card...I think I'll try to get a tutorial posted in the next few days to show you how to create it...super simple using a SU! punch. :-) Enjoy your weekend! Once the world's Redeemer, dying, bore our sins upon the tree; On that sacrifice relaying, now I look in hope to thee. Father, take me, all forgiving, Fold me to thy loving breast; In thy love forever living, I must be forever blest. Please feel free to share something you've created based on this week's theme of sacrifice. You may want to focus on someone who has sacrified for you; your parents, family members, or friends, all of these given to you as a blessing from God. Or perhaps you'd like to focus your effort solely on Christ's work on the cross. Whatever you prefer, please leave us a comment on the SALT blog along with a link back to your blog or gallery. It would be a tremendous blessing for you to share your work with us! Thank you for your continued support of our challenge blog. We treasure each and every comment and work! Stay tuned for news of our new design team, being announced in the next week! Did you hear the good news? Johanna has decided to continue her Valentine's Day sale on all Limited Edition Kits! The sale includes the Fairytale kit, the Ladies Dancing kit, and the Monkey Business kit. The Limited Edition kits each contain a sheet of unmounted stamps, vintage clip art, cardstock, patterned paper, and embellishments, such as ribbon, lace, buttons, and the like. Here's a link to the kits. For inspiration, visit the Limited Edition Kit Section of the online gallery. While you're visiting the gallery, you might want to take a gander at all the other eye candy! My card was created using pieces of the Ladies Dancing kit, which is available in Vintage and Bright. The kit contains stamps of different skirts, feet, heads, hats, purses, bodies...you name it...to mix and match! It's like playing with paper dolls - too fun!! Enjoy! Have a fun, quick and easy project to share with you tonight. This is an idea I grabbed off of the Stampin' Up! web site and demonstrated at my monthly class this past Friday evening. 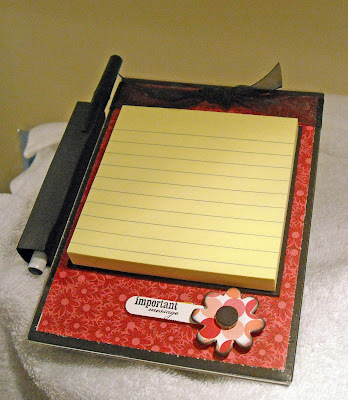 This is a note holder that is made out of an inexpensive 5x7" plastic photo frame. I picked up the frame at my local dollar store...how's that for inexpensive! You've probably seen these frames before, they are made out of molded plastic, all one piece, and include a small "lip" that is used to hold the frame up. Instead of sitting on top of the lip the frame has been tipped over and the lip is being used to hold up the sticky notes. See below: Finishing the decoration of the holder is a piece of cake! Cardstock, plain and patterned, has been cut to size and slid into the holder. (BTW - The delightful patterned paper is new from SU! and I adore every single piece in the pack...Will post more with this paper soon!!) I cut a piece of black cardstock to frame the note paper pad and added a chipboard flower and sentiment to the bottom of the frame, a ribbon on the top. The pen holder is created by taking a 4x4.5" piece of cardstock and scoring at every 1/4". Simply fold along the score lines to create a box. Add tape to hold it together and then tape the remaining 1/4" flap to the underside of the frame. 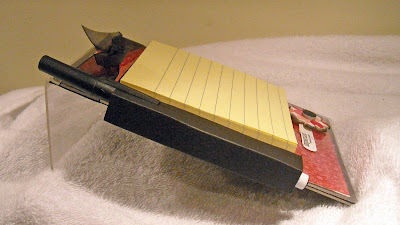 This was a fun project and everyone enjoyed making their note taker/holder...this thing needs an official name! ;-) Easy peasy! Enjoy! When I saw the friend challenge on Nicole's blog, have you seen all that's been going on over at Papertreyink, holy moly, I knew I had to make a card to post for my friend Julie. You see Julie is a very good friend that I met through blogging. Now I know a lot of folks meet this way but wait until you here my story of how we met... A few months after I started my blog I received an email from Julie, who happens to be a fellow Stampin' Up! demonstrator. She wanted to sign up to attend a craft fair but she had a small problem...she was having a baby two weeks before the fair. She wanted to know if I'd like to split the table with her. Sure, I said, sounds like fun! (Plus I thought maybe I'd get the added bonus of getting in some newborn baby snuggles...) The day of the fair arrived and it was cold, windy, and rainy...yuk...And we were going to be in outdoor tents...double yuk. The tents had four walls so we were somewhat shielded from the weather but it was still cold. I didn't thaw out from being outside all day until I took a very hot shower that night! Anyway...Julie arrived with her sweet bundle of joy in tow...Yes, she had a baby two weeks before and she was going to sit with me in a freezing tent for hours in hopes that we might sell a few crafty things and make some contacts. I give her credit, I would have stayed home! :-) Now we'd never met in person so here we are, two total strangers, hanging out together...did I mention that we were freezing...at this craft fair. We chitchat, of course, we're two women for goodness sake, for a few hours. I get in some baby snuggle time...ohhh...I just love the newborn stage...and she happens to mention the name of her pastor, because he has a distinct name. At this, I sit up and exclaim, "hey, I know your pastor! Your pastor knows my pastor! I know about your church, I know where your church is"! Turns out we weren't such strangers after all...and before long we had bonded like sisters...well, it turns out, we are spiritual sisters! I love the whole small world thing... It's now a year and a half later and I've had the joy of getting to know Julie more, have spent time playing with our kiddies (she is far more organized with four than I am with two! You go girl! ), have spent far too many hours chatting over lunches and dinners, have worn out the soles of our feet shopping, and are now enjoying our time organizing (with Joanne) the upcoming Stamp NE! I am grateful that God had our paths cross, in a somewhat unusual way, and am grateful to have Julie as my friend! Love you girlie! Oh yeah, the card! Since this was for PTI, I, of course, used my PTI goodies. 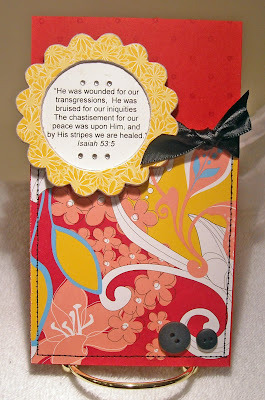 All of the images are from PTI, including the background stamps that I used to make patterned paper. Buttons and paper are from SU! Enjoy and be sure to check out the happenings on Nicole's blog...amazing stuff!! The germs I was fighting a few days ago turned into a full blown, nasty coughing, sneezing, stuffy head so I couldn't do a darn thing cold! Yesterday was spent relaxing on the couch with hot tea, tissues, and all the Disney movies I could handle! Thankfully, both munchkins were content to veg with us and played wonderfully while my husband and I took turns whining about our condition. LOL! So...there wasn't much blog posting or surfing for me yesterday! Today I can at least breathe (breathing is really a wonderful thing) and am feeling a bit better so let the posting resume! This is a simple card I created for my friend's daughter, whose birthday was last weekend. They had her party at a gymnasium and boy was it fun for the kids! I had to keep myself from not jumping on the trampoline's and big foamy things for fear of being asked to leave...hee hee On the way home my son asked if he could start going to the "gym" every day! He loved it! The stamp set used is a new Stampin' Up! set that is just adorable! The set comes with three little "bees", a bee hive, a flower, and two sentiments. This was one of those sets that I picked up because I thought a few customers would like it but I wasn't "moved" by it. However, after using the set a few times, I am hooked! It is the most adorable set and I look forward to using it more and posting more creations! This card couldn't have been easier! I punched five 1 1/4" squares and stamped, embossing with white embossing powder, the three bees. I then added some faux white stitching around the bee squares. The remaining two squares were left plain and acted as a few accent colors...and a good house for my button. The top part of the card was stamped using a SU! polka dot background. The paper at the bottom on the card is something I found during my last shopping trip to Wholly Scrap, our local scrapbooking store. Since I'm feeling better today I need to get to all those chores that were left undone over the weekend!! How fun for me! ;-) Enjoy your Monday! I have a box full of Odd Bird Planet stamps that have been sitting on my counter, having yet to see ink, for months! Good gracious, what have I been waiting for? Last night, as I fought the cold that I just knew was creeping up on me (hello cold, nice to see you here today), I decided to relax in the stamping room. No rush to finish a design project, no need to finish any birthday, anniversary, or get well cards, just a time to sit and play with my "new" stamps that are now about three months old! This adorable stock is part of a fairly recent OBP release that included a number of delightful baby images. Since my stash is lacking in baby-themed stamps I decided to order a few over the summer. Pairing this image with some adorable Crate baby print paper was perfect! And I know I say this all the time but, my goodness, I love Crate paper!! It's thick, it's textured, it's a pure delight...Now go out there and buy some doggone it! This paper pack included a few darling paper "ribbons." 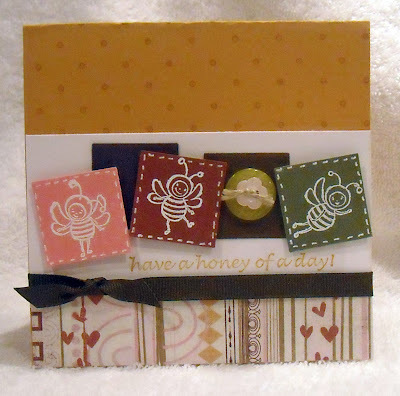 For this card I used the scalloped bee design. The stock is colored with Copics (Hey, I'm taking a Copic certification class in March...I cannot wait!!) and the little baby bundle in the stock's mouth was paper pieced with some more luscious Crate paper. The scalloped circle and button was added behind/on top of the stock for a little extra "umph." 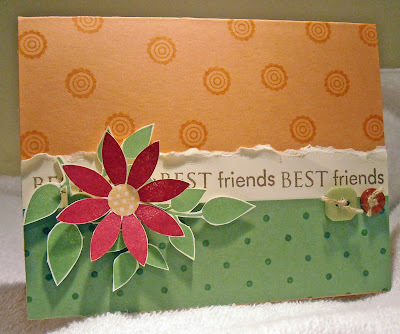 And I finished the card off with my all time favorite rub on sentiments from Stampin' Up! Now...I just need to find someone who is having a baby...Anyone? This week over on the SALT blog it was Hazel's turn to set the challenge and she chose discipleship. She has an excellent write up on the SALT blog, be sure to check it out! When I was thinking about the challenge I was having a tough time coming up with a way to focus the thought of discipleship into a project. I am most thankful to my husband for suggesting I read Psalm 86 where David prays, "teach me your way, O Lord", which was a perfect heading for this week's study. As Hazel mentions on the SALT blog, Christian discipleship involves learning about Christ through Bible reading and church attendance, practicing obedience to His commands, and seeking to be more Christ-like each and every day. In Psalm 86 David confesses his lowliness and neediness of a Savior; he then meditates on the excellencies of the Lord, praising him for His compassion, longsuffering, graciousness, mercy, and truth. David goes on to ask God to teach him to be like Christ, to walk in His truth, to unite his heart to glorify His name forever. Through this type of prayer, David was asking God to help him in his discipleship. One of the joys and mysteries of the Christian walk is that you never stop learning or growing. The Bible, no matter how many times you may read it, is forever unfolding in it's glorious truths. There is never a dull moment in our Christian lives for God is forever using every day circumstances - good and bad - to teach us how to fulfill the great commission, "love the Lord you God with all your heart, all your mind, and all your soul. And love your neighbor as yourself." There is no real, lasting sorrow in serving Christ, only lasting joy and a gratefulness at being called one of His disciples. 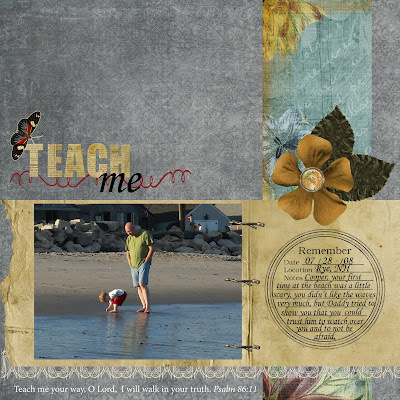 For my layout today (another digital scrapbook page! Yeah! ), I wanted to illustrate the concept of God being our heavenly Father and leading His children by showing my husband, an earthly Father, leading one of his children. A child can be frightened and unsure of the world around him, as our youngest was the first time at the ocean, so can we when we're hit with uncertainties and heartache. Yet, as a Father loves, cares, and protects his children (holding our son and comforting him when scared of the waves and teaching him trust that we'll watch over him) God loves, cares, and protects us when we face difficult trials. May we be encouraged by knowing that as a disciple, God will never leave or forsake us, and in that truth may we allow God to teach us to trust Him competely. Please visit the SALT blog to see all of the other team's beautiful creations! And a reminder that the deadline for design team submissions in on 2/15. We've received some wonderful work and are looking forward to introducing you to the new team members in a few weeks!! I have lots to share today but none of it is a card! :-) However, I'm hard at work on my SALT challenge, which will posted tomorrow so check back! First, I have been award two lovely awards from my sweet friend Hazel. Forgive me Hazel for taking so long to get these posted! The first is the Lemonade Award, which is to recognize someone who shows a great attitude or gratitude and the second, the Encouraged Award. For this award you need to post a link of the person who gave you this award, nominate five other people, let your nominators know that they got an award from you, and put a logo of the award on your blog. Well...finding just five folks to pass these awards onto is quite a task! There are so many folks who are a source of encouragement and inspiration out there. If you're a regular visitor, please feel free to post these on your blog and thank you so much for your friendships and continued support!! In other BIG news...You may have noticed the Stamp New England badge that I added to my blog. Very exciting stuff!! Julie Masse and Joanne Basile invited me to help them organize a New England stamping event!! A large group of stampers will be spending a day and a half stamping in Portsmouth New Hampshire. There will be classes, prizes and lots of visiting!!! If you live in the North East (or if you feel like travelling in....) we'd LOVE to have you. We've started a blog with the details which you can find HERE. There, you'll find all the particulars about the location, agenda as well as the pricing. Bring a friend, bring a few! Starting next week, we'll be introducing the designers who will be leading the hands on stamping workshops! To start, we'll be sharing the weekend with Jodi Collins, and Lauren Meader, and Cindy Lawrence! And how about those prizes? 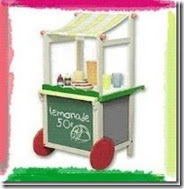 Look at the fantastic list of vendors that have already agreed to provide door prizes for the event! My Favorite Things, Gina K Designs, Paper Pretties, Odd Bird Planet, Say it With Letters, Emma's Paperie, Scor Pal and Stamping Bella. So, I hope you'll come visit us at Stamp New England. There are a limited number of spaces so if you're interested, please visit the blog soon!! Thanks to Stampin' Up! for providing this layout in a recent demonstrator magazine, I was able to create a fast and easy birthday card from my husband's Grandmother, who will be turning 90 next week! 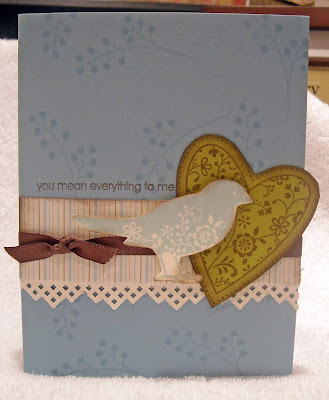 All of the products used on this card are from Stampin' Up!. One of my favorite parts of the card is the navy ink on the white cardstock. This probably isn't something I'd consider trying but again, thanks to an SU! publication, I saw something similar and decided to give it a try. The look is so clean and crisp...just love it and I will have to use this style on another card sometime! 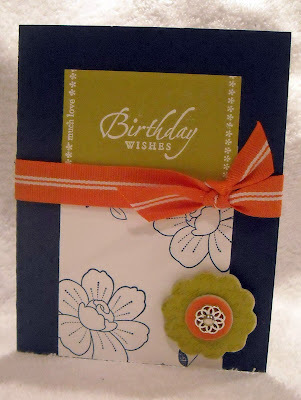 The "birthday wishes" and border was embossed with white embossing powder to help it pop off of the kiwi kiss paper, isn't that a great green! And the orange ribbon provides a nice contrasting color...love mixing bold colors together! The one element that you can't see, which kind of bums me out is that the background of the card has been stamped with polka dots...a blue ink on blue paper thing so that may be a reason it's hard to see in the photo... Hoping "Gram" likes her card and enjoys her 90th birthday!! And hope you enjoy your Sunday evening!